The second tropical storm of the 2015 Atlantic Hurricane Season will likely be known as the second drought buster that did more harm than good, and then kept going. Just about two weeks ago, a previously upper level system moved into central Gulf of Mexico from the far western Caribbean and had worked its way down to the surface with tropical storm force winds. Even as a warm-colored blob on the hurricanes.gov webpage, scatterometry wind analyses showed that tropical storm force winds expanded into a sizable portion of the Gulf. The eastern semicircle of 91L was very much like a tropical storm with the aforementioned winds and plentiful convection. It took numerous hurricane hunter flights in order to close off a closed low, which didn’t happen until June 15th. Note: This post may contain some opinions, and these are my opinions alone. They do not reflect the opinion of any government, public or private agency. Leading up to this nearly late classification, there were some wranglings on social media about the social science applications of the definition of a tropical cyclone. In this instance, the “closed surface wind circulation about a well-defined center” (NHC) was deemed by many as being in the way of offering tropical storm advisories onshore and marine areas. Coastal flood warnings, gale warnings, and flood watches were replaced in part by tropical storm warnings upon formation 155 miles SSE of Galveston, TX. This is sort of the reverse of the Hurricane Sandy situation. NHC continues to work on these policies, and we should see changes in the next couple of years. Even while we were pretending that this was a tropical storm without a name, the forecast for this system was well done with the exception of one slight westward jog as named Tropical Storm Bill approached the coast around midday on June 16th. These jogs are pretty hard to forecast. The two driving points during this tropical system’s approach was the flood potential and potential for Bill to go well inland as a tropical cyclone. Satellite imagery below showed that Bill had a characteristic strong feeder band on the eastern and southern sides. That band also reignited with severe weather and other convective activity as it approached the mid-Atlantic. 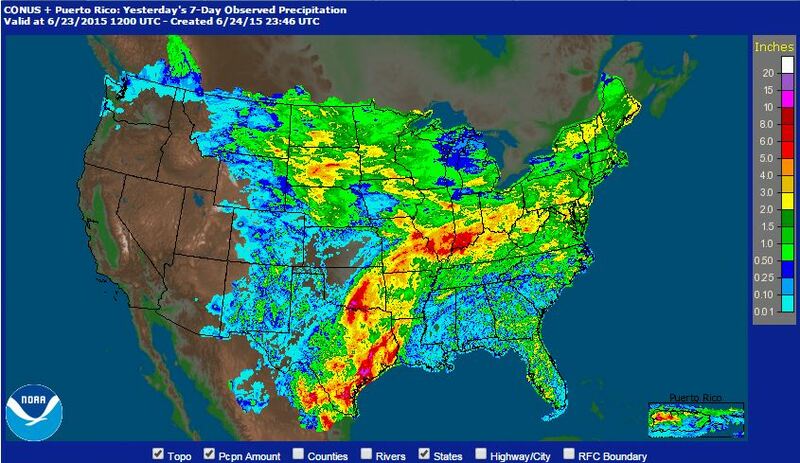 Rainfall amounts of 4″ or more fell in 8 states. As Bill moved across the Mississippi River, it became truly just a rainmaker for most. It not only helped relieve drought in the southern Plains, whether they needed it or not, Bill also helped relieve drought in the southern Midwest. Bill had at least one more trick up its sleeve as it crossed the country. Along with the flood warnings that followed Bill to the east coast, there was enough energy in front of Bill to re-energize the characteristic stronger eastern semi-circle. Although not entirely due to Bill, the mid-Atlantic and mid-Appalachians saw more than 250 severe wind reports on June 20th into the morning of the 21st. 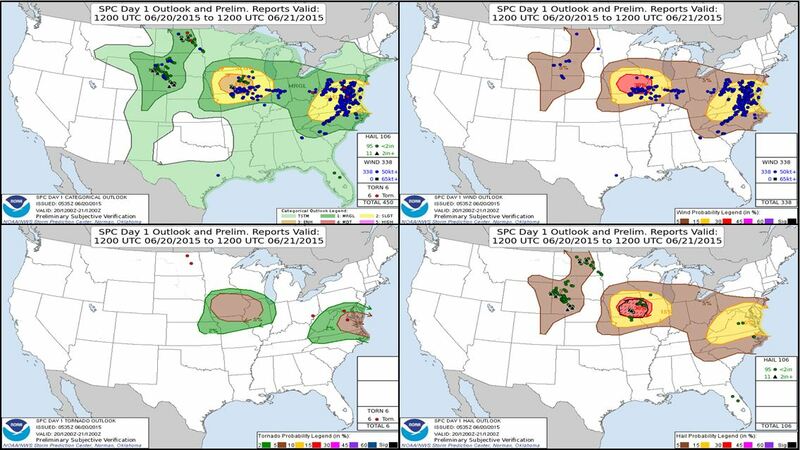 These reports, below in verification of the SPC outlook, also saw a few reports of tornadoes and hail. You can see the eastern side of the remnants of Bill explode as it approaches the east coast and then decay as it moves into the northern Atlantic on the below NASA satellite imagery. Baltimore, Washington, and Richmond all had severe weather warnings of one kind or another. You can also see how clear the rest of the tropics were (and remain) and how much stronger the Mesoscale Convective System was in comparison to this named system. This loop reminds us that a name is not necessarily a sign of strength, especially during the spring in comparison to the plains severe storms. 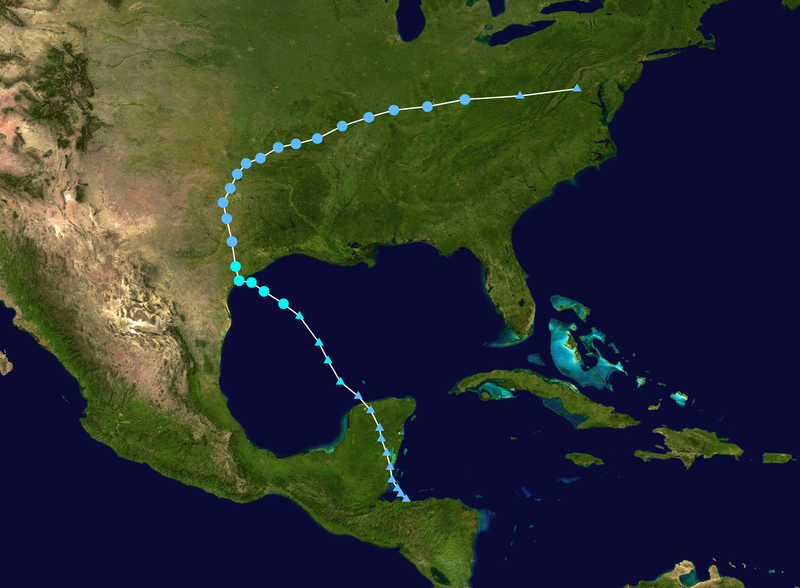 Just like Erin and Fay, Bill will likely be remembered for being a long tracking rainstorm rather than a 60 mph tropical storm that formed quickly in the Gulf of Mexico. Ana and Bill also drive home the point that it only takes 1 or 2 landfalls to make a season memorable for a certain area, even in an El Niño. These two storms are likely the first time two consecutive tropical cyclones to make landfall in the US since 2008. With five months left in this season, it is important to remember that it only takes one to cause problems. Let’s hope that the third system is a charm and stays out to sea. It’ll likely take a while until the damage toll is realized, at least from flooding alone. I’ll be watching for our next system. Let me know if I missed anything, or what you would like to see here. Posted on Monday, June 29th, 2015, in Tropical Weather. Bookmark the permalink. Leave a comment.